Johannesburg, Dec 28 - Swiss tennis ace Roger Federer has announced that former Swedish tennis player Stefan Edberg will join his coaching team in the New Year. Federer made the announcement on his Facebook page, saying that Edberg will join long-time coach, Severin Luthi, as part of his team in time for the start of the year's first Grand Slam, the Australian Open . Washington, Dec 25 - Swiss tennis ace Roger Federer has reportedly said on Twitter that he and his wife Mirka are expecting another child next year. The 17-time Grand Slam winner, who has spent more weeks at No. 1 than anyone else in the history of the ATP rankings, is the father of twin daughters Charlene and Myla, who were born in July 2009. According to the Huffington Post, Federer tweeted that he and Mirka are happy to share the news that their daughters would be 'big sisters' in 2014. Johannesburg, Oct 22 - 17-time Grand Slam champion Roger Federer has admitted that serious errors in his planning have contributed to a disastrous 2013 campaign but insisted that retirement is not on his agenda. Washington, Aug 16 : Roger Federer would face Rafael Nadal for the 31st time after advancing to the last eight at the Western and Southern Open tennis championship. In their first 30 meetings, Nadal holds the edge over the Swiss maestro having won 20 times. However, they have a 6-6 record when it comes to playing on hard court, reports Xinhua. Between them, they have won 29 Grand Slam titles. London, June 26 : Swiss tennis great Roger Federer has been banned from wearing his orange-soled training shoes at Wimbledon after they were found to be against the all-white dress code of the tournament. The seven-time champion at the All England Lawn Tennis Club (AELTC) had worn those shoes in his first round match Monday. The Grand Slam rule book for Wimbledon states that "players at Wimbledon must be dressed almost entirely in white". The BBC reported AELTC officials spoke to a number of players about their dress code on the first two days of championship. Washington, Feb 28 : Swiss tennis ace Roger Federer has claimed adding more titles to his already huge Grand Slam trophy cabinet is currently his priority over retaining world number one status. As Federer approaches the twilight of his glittering career, the 17-time major winner is prioritizing adding to that record haul over returning to the No. 1 spot, the CNN. com reports. After clinching a record-equalling seventh Wimbledon singles title last year, the Swiss maestro occupied the top berth for a 287th week, breaking the previous record held by U. S. icon Pete Sampras. Manama, Feb 25 : Former World No. 1 Roger Federer has said that he is hoping for inspiration from his recent trip to South Africa so that he can successfully defend his Dubai Duty Free Men's Open singles title. Melbourne, Jan 26 : Andy Murray spent four hours to beat Roger Federer for the first time in a Grand Slam match. The Scot admitted that he would need decent rest to recover from the fractious finish in the semifinal if he is to take the Australian Open title away from Novak Djokovic Sunday. London, Jan 24 : Swiss ace Roger Federer has admitted world number three Andy Murray is a much-improved player now, adding the Scot would provide a stiffer challenge than ever in the Australian Open semifinal. Murray and Federer meet for the 20th time on Friday, in the semi-finals of the Australian Open, with the Olympic gold medallist holding a 10-9 advantage, but the world number two has won all three of their Grand Slam clashes, the Daily Mirror reports. Sydney, Jan 11 : Swiss tennis great Roger Federer believes world number one Novak Djokovic has been the best hard court player in the past couple of years, and he tipped the Serb to win this year's Australian Open. Djokovic can join Federer and Andre Agassi as the only men to win four Australian Open titles after thwarting Federer''s own quest for a historic three in a row in the 2008 semi-finals and then downing Jo-Wilfried Tsonga to claim his maiden major in Melbourne, the Age reports. Washington, Sept 9 : Five-time champion Roger Federer has reached the US Open semi-finals after defeating French tennis star Jo-Wilfried Tsonga. 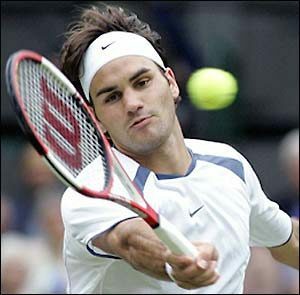 Federer beat Tsonga 6-4, 6-3, 6-3, and will now face Serbia’s Novak Djokovic in the semi-finals. Djokovic beat fellow countryman Janko Tipsarevic in five dramatic sets score to reach the semi-finals. It was party time for Roger Federer who couldn't help but savor over his first Grand Slam victory as a father but already looking forward to the defend his French Open crown. Federer partied until dawn in Melbourne on Monday and enjoyed drinking champagne too. The 28-year-old Swiss was able to extend his record to 16 major titles along with dashing British hopes of a first men's Grand Slam champion in 74 years, after defeating Andy Murray in the Australian Open final. The father of six-month old twin girls feels that there is still lot for him to prove on the tour. London, Dec 31 : Rafael Nadal's epic Wimbledon victory over Roger Federer in 2008 has been voted as the sporting moment of the decade. In a poll conducted by the Daily Telegraph, Nadal's 6-4, 6-4, 6-7, 6-7, 9-7 triumph in near darkness that snapped Federer's winning run at Wimbledon has topped all other sporting moments of the decade, receiving 17 per cent of votes. Liverpool's 'Miracle of Istanbul' came second with 15 per cent votes. Arsenal's 'Invincible' season of 2003-04 was third with 13 per cent. England's Rugby World Cup victory in 2003 came fourth, with 11 per cent of the vote. 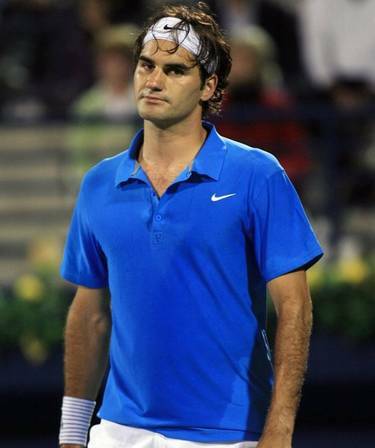 London, Nov 28 : Tennis star Roger Federer has said that World No. 5 Del Potro deserved to go through for the final stages of the World Tour Finals. Potro was controversially given the green signal for the end-of-season event, which eliminated World No 3 and local favourite Andy Murray. Murray became only the fifth player since 1970 to win two matches, but fail to make the semis. London, Nov 27 - Roger Federer and Juan Del Potro qualified in nail-biting style for semi-final places in the ATP World Tour Finals, with Scot Andy Murray kept from a spot by the tyranny of mathematics. Federer won Group A despite taking a loss in his Thursday match to Del Potro 6-2, 6-7 (5-7), 6-3, a result which eliminated Murray on winning game percentage despite his earlier defeat of Spain's Fernando Verdasco 6-4, 6-7 (4-7), 7-6 (7-3). The maths could not have been more complex for places at the weekend at the eight-man season wrapup. London, Nov 25 - Roger Federer clinched the year-end world number one title a year after losing it to Rafael Nadal, regaining the honour with a 3-6, 6-3, 6-1 defeat of Andy Murray at the ATP World Tour Finals. For the second time in as many matches, Switzerland's 15-time Grand Slam winner had to rally Tuesday after losing an opening set. The comeback victory in two hours improved his record against the fourth-ranked Scot to 4-6 and marked his second success in a row in that series after winning a Cincinnati semi-final last summer. London - Roger Federer and Andy Murray kick-started the ATP World Tour Finals Sunday after a move from China to Britain, with both earning opening group victories at the eight-man year-end showcase. Top seed Federer lost the first set of his career to Fernando Verdasco, but regrouped after a big effort to defeat the Spaniard 4-6, 7-5, 6-1 in their Group A clash of an event held for the last four years in Shanghai. Paris - Roger Federer remains unruffled by his second-round exit to Julien Benneteau at the Paris Masters, with the Swiss number one convinced that he can live with a week of training at home before heading to London for the new year-end final. The Swiss suffered his second setback in four days after going down to Novak Djokovic in the final at home in Basle - but there is no panic on Team Federer.